Much to my surprise Jackson getting glasses went really well today! He put them on inside the doctors office and said "wow i can see"! Well Good!!!! Our eye doctor (also a baseball coach) recommended we take Jackson to the batting cage for the next few days and let him hit so he can get used to seeing the ball with his glasses! He told us to let him hit a few balls without his glasses and then have him put his glass on and see if there is a difference... wow!!!! at the difference! It is amazing how much better he hits the ball already! He was hitting it so much harder...RP was grinning from ear to ear as he pitched to him... he was lovin these hard hit balls coming at him almost taking his head off :)! Then he took him to the field and did a little fielding with him "just to see" and again it made a big difference! I am so glad we have already seen a difference! I know all things don't revolve around baseball but today that is where we have seen the biggest difference ourselves this first day! I know tomorrow when he goes to school and can see the board and read signs he has not been able to read from afar he will excited too! I just hope all the little meanies stay away and no one calls him names and breaks his little spirit b.c right now he is excited about them and I know is glad he can see! 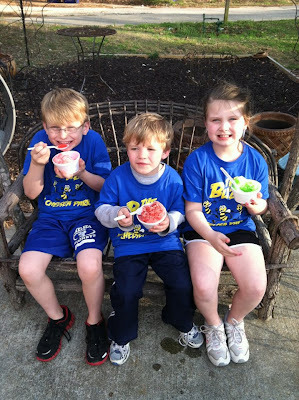 after our little trip to pick up JP's glasses we headed to the snow shack for a little shaved ice and then to the park to enjoy this beautiful weather... could today have been any prettier??? ?